Jeff Krueger of Bainbridge Island has been named President of Bainbridge-based Clark Construction, LLC. The move was announced by Rachele Turnbull, Clark founder, who has served as President and CEO and will now assume the sole role of company CEO. Krueger joined Clark Construction in 2013 and has been serving as Vice President, a key member of Clark’s executive and leadership team. In the role of President, he will oversee all day-to-day construction operations and project teams. Krueger began his construction career as a summer laborer for Fairbank Construction Co. while in high school in the early 1980s. He continued this summer work while earning B.A. in Elementary Education and spending six years as a grade school teacher. Moving to Fairbank full time, he served for 10 years as Project Manager, Safety Officer and Manpower Manager on projects ranging from $15,000 decks to a $5 million condominium. After spending seven years in Kenya with his family, building and managing a 130-acre dairy farm and orphan outreach center, Krueger returned to Bainbridge Island and joined Clark Construction. He and his wife have raised two daughters on the island and are deeply committed to the Bainbridge community. Rachele Turnbull’s visionary spirit and strong leadership have guided Clark Construction to success for over a decade. As CEO, she will focus on corporate development and taking the company through the next stages of growth. 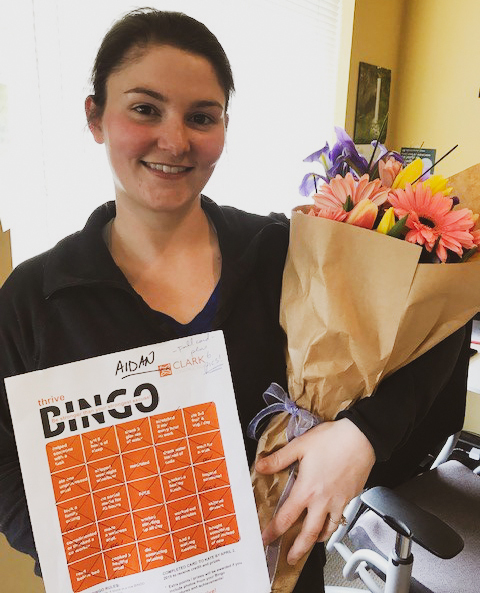 To better serve clients and team, she will concentrate on resource management and communication systems, conduct cost estimating and analysis, constructability and design review. At Clark we are consciously making decisions informed by the ideals of stewardship and sustainability. 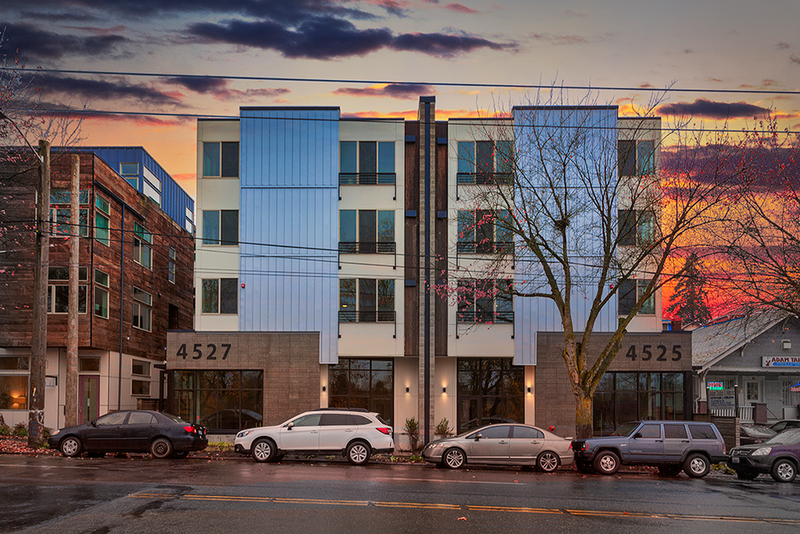 We encourage you to read this article Washington Just Advanced the Nation’s Best ADU Reform outlining new state legislation close to being finalized that will help facilitate multi-generational living, age in place, resource management and a host of other good things by making it easier to build ADU’s. Bigger is not always better… let's think outside the box! A good cause and good style! Semi-annual employee shop-up at the Seattle Children's Bainbridge Bargain Boutique! Clark gives each employee credit to spend at the Boutique, helping to support a good cause and good style! It was a fantastic Lunch & Learn today at the Clark offices, with Raymond Lam from Silk Road Environmental! Specializing in innovative, cost-effective products to reduce the carbon footprint of their clients, Silk Road Environmental reviewed the theory and application of their systems, including solar hot water heaters and phase change material. Even the most efficient construction produces a lot of wood waste. After raw lumber is shaped into a beautiful new home or remodel, board ends and random scraps are typically sent straight to the dump. So how are we tackling this big challenge in the construction industry? 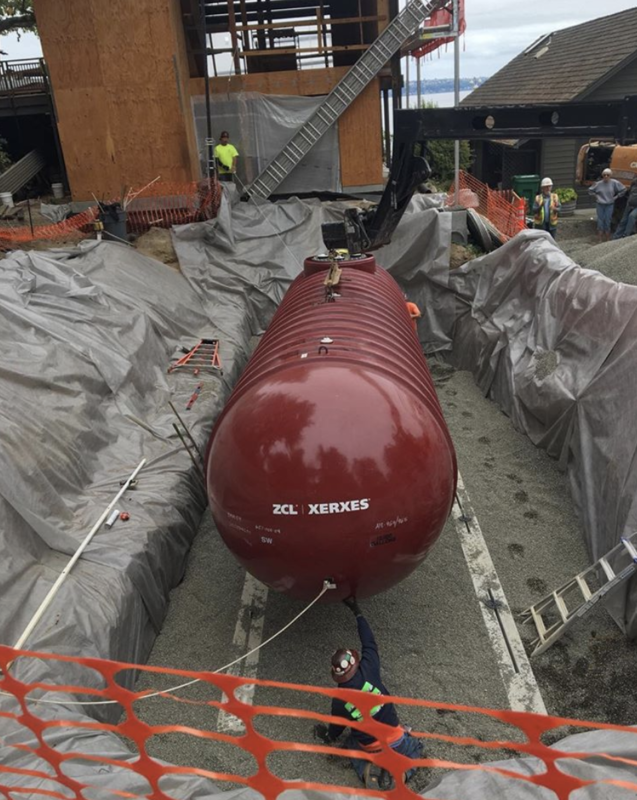 At our historic Loom House job site on Bainbridge Island, we are finding a better way – a kinder, environmentally conscious method of dealing with construction waste. 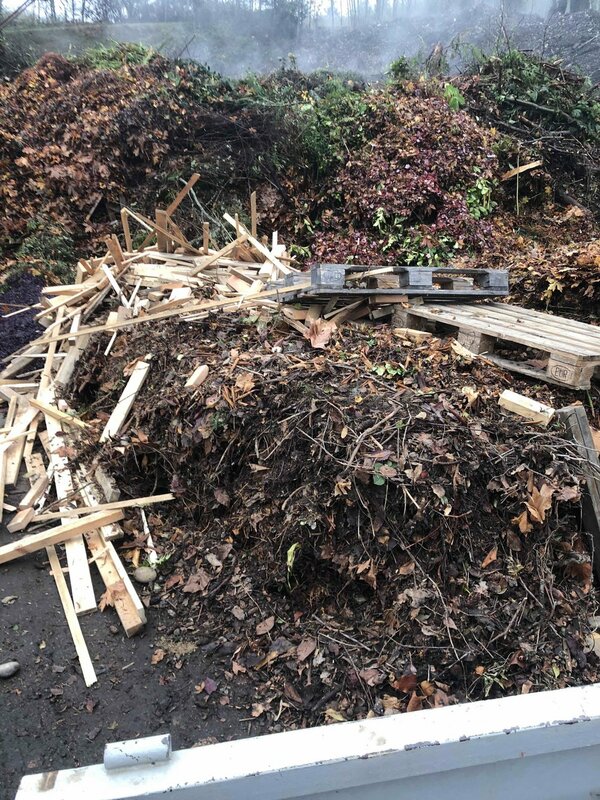 At this Living Building Challenge remodel, our team is taking the time to separate out untreated waste pieces – those without coating, paint or preservative – and divert them to recyclers, who will turn these scraps into useful biomass or mulch. We also salvage old siding and paneling via selective demolition, removing all nails and fasteners by hand. That way, these extra materials can be used for new siding on the home. Other fixtures left over from the remodel – cabinets, windows and doors, vanities, hand railings – have gone to Habitat for Humanity for a second life in new affordable homes. All told, we have sent waste and unwanted materials from the Loom House to more than a half-dozen vendors and contractors to be reused and recycled for other projects! Yes, this takes extra time and effort. But at Clark, we believe that keeping leftover wood products out of the disposal stream is just good policy — the kind of care and high standards our clients appreciate. 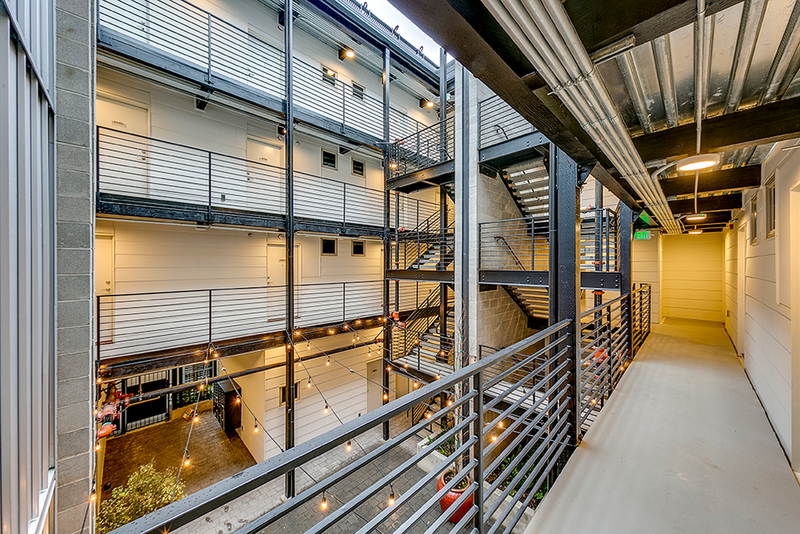 The remodel of this 100-year-old, 6,600 sq ft facility, located in the heart of Winslow on Bainbridge Island, included structural upgrades of CMU to existing wood connections and tenant improvements. 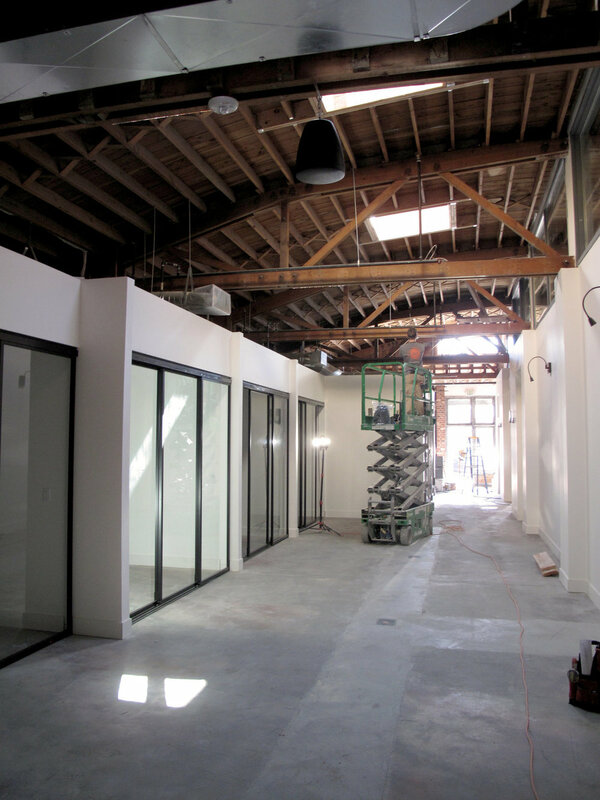 The renovated space now houses Bruciato Pizzeria and the offices of Realogics Sotheby’s International Realty. The Pleasant Beach Village Lodge is coming together beautifully. 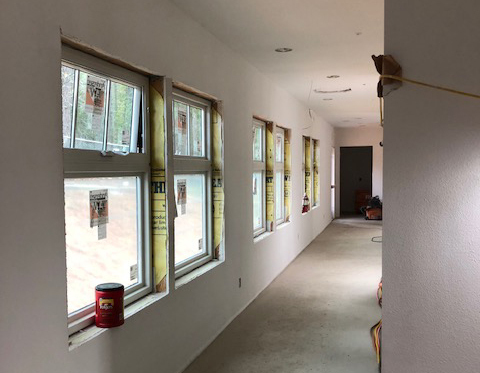 With an anticipated completion in late April, the lodge is ahead of schedule and currently in the finishes phase: trim, tile, and wood floors are going in. Crafted by Clark Construction to match the historical charm of the Lynwood Center neighborhood. This addition brings 10 new guest rooms in a 2-story, 6,800 sf. lodge to Pleasant Beach Village on Bainbridge Island. 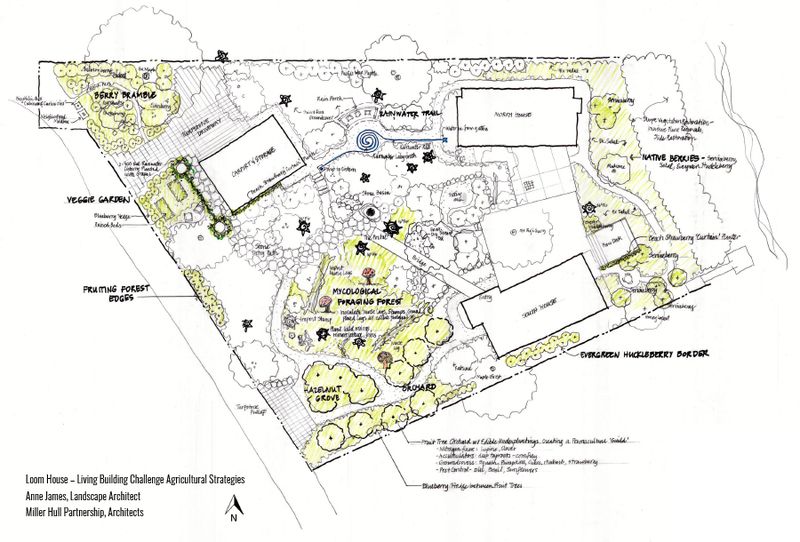 Energy independence is a key goal of the Living Building Challenge – projects must generate 105 percent of their own power using renewable sources, and provide onsite storage for system resiliency. It’s called net-positive energy, and it’s a very high bar to reach. 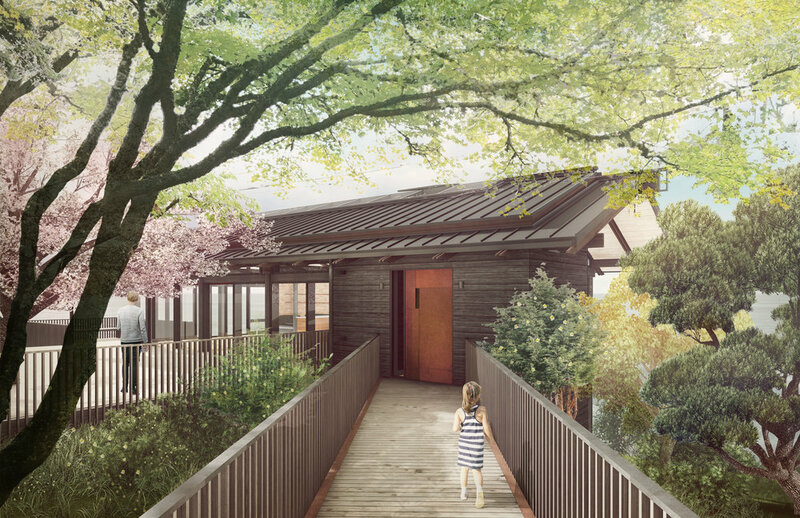 The Loom House on Bainbridge Island is up to the challenge. 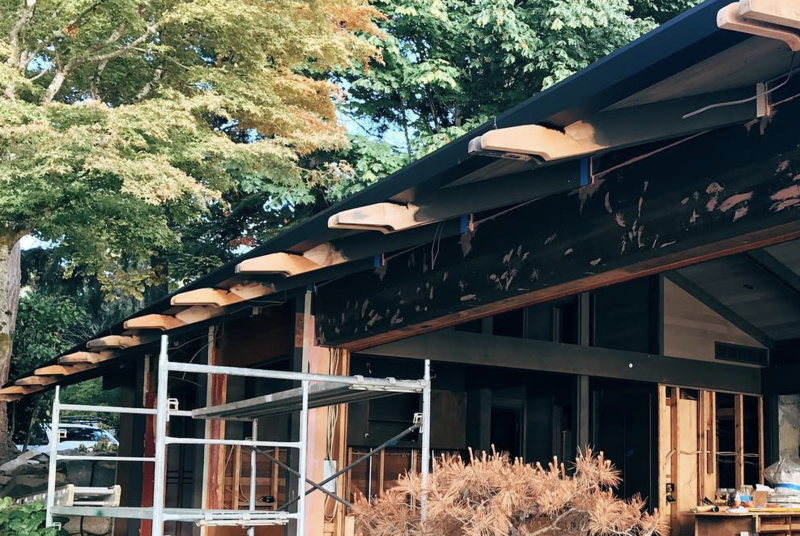 The distinctive midcentury-modern home – the first residential remodel set to achieve Living Building certification – will boast an expansive solar array plus cutting-edge battery backup. A team from Cascadia Solar of Port Townsend was onsite this week, installing a powerful 15kW system against the backdrop of Puget Sound and the distant Seattle skyline. 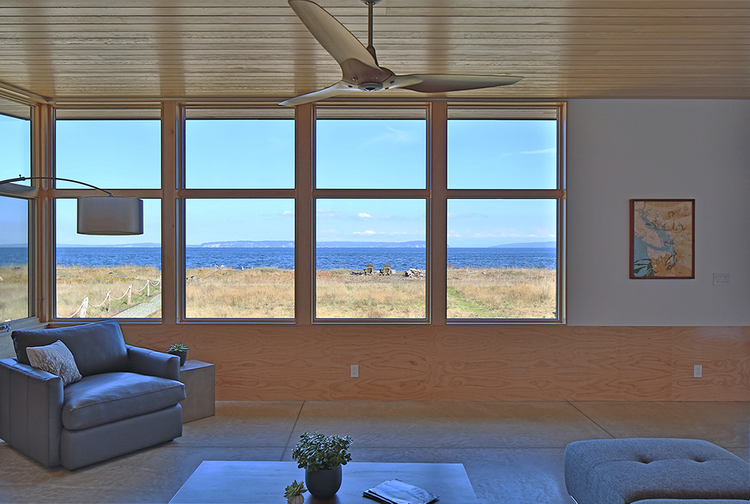 To optimize solar harvest, project architects Miller Hull and Clark Construction shifted the home’s skylights to the north slope of the roof, leaving the expansive south slope totally open for solar. The 42 powerful, 365-watt modules will enjoy generous solar exposure from daybreak through the afternoon. An onsite 13kWh, two-battery backup will capture excess production and keep the home humming if the local grid goes down during storms. Couple the solar component with an ultra-tight building envelope, and you have a formula for comfortable, sustainable living: produce more energy, and use less. Find out more about the Loom House’s many energy-efficient features here. 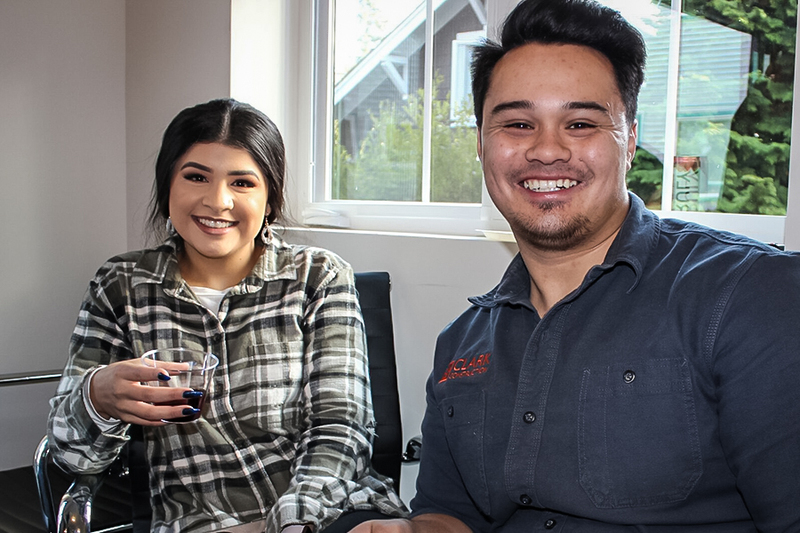 Quality student housing is always in demand around the University of Washington, and Clark Construction, LLC is helping the developer to meet the need. 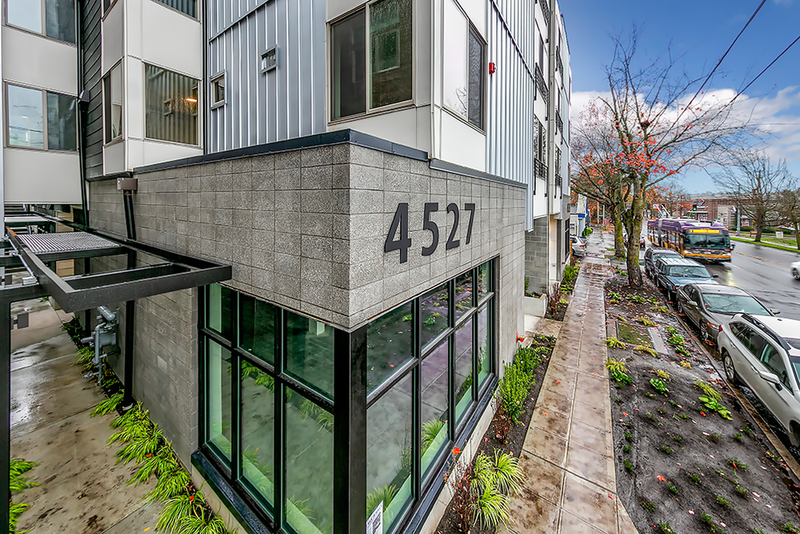 The new 4710 Flats will bring 52 snug, comfortable apartment units to the U-District near campus, just a short walk to the University Village shopping area and other services. Apartment units range from 250-300 sf., over four floors with a rooftop deck, a great new addition to the neighborhood’s student housing stock. Availability is set for mid-2019. 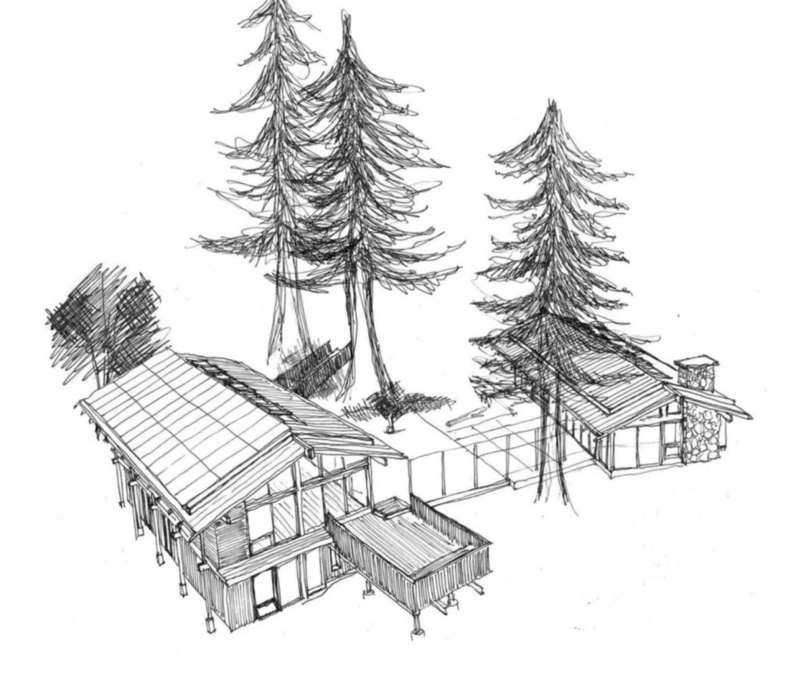 When Clark Construction began renovating the Loom house on Bainbridge Island – bringing an older home up to the rigorous standards of the Living Building Challenge – we had to demonstrate exceptional concern for the environment. That care extended to the landscape , where a beautiful Chinese dogwood (Cornus kousa) was growing in the footprint of where the new carport is being built. The solution: move the tree. Working with Anne C. James of Anne James Landscape Architecture of Redmond, Wash., and David M. Ohashi of Ohashi Landscape Services of Issaquah, we saved the tree and safely relocated it elsewhere on the property. Moving the tree was a precise and painstaking process, beginning with timing – the tree had to be moved during the winter dormant period, and was transplanted in February 2018. The soil at the outer perimeter of the root zone was excavated with an air spade to reduce the weight of the root ball to be lifted, an estimated 5,500-6,000 pounds. The air spade removes soil with compressed air, blowing the soilaway and leaving the roots intact and undamaged. About two feet of soil was removed around the perimeter, leaving a root ball about eight feet across, with a couple more feet of roots dangling in mid-air beyond all the way around. These exposed roots were painted with a hydrogel to keep them from drying out until the root ball was hand dug and wrapped in burlap, and the tree moved a couple of days later. A large, extended-reach forklift was used to transport the tree to the lower driveway, where it could be maneuvered into place. The tree has settled in nicely, and bloomed in July. A huge thank you to everyone who came to our new office Open House on Friday. We enjoyed sharing our new space with you. We are very excited to announce the big move to our new, permanent offices at 355 Ericksen Ave, here on Bainbridge Island! At Clark Construction we are committed to efficient, sustainable building practices, and that starts with our own building. We invite you to stop by anytime between 3 and 7pm this Friday, October 12th. Parking is limited, so we suggest parking at Bainbridge Performing Arts, and walking up. We look forward to welcoming you to our new home! View the official invite here.